CONTINUE READING TO ENTER GIVEAWAY!!! I would like to say thank you to Nina from Cooper Smith Agency, who hooked me up with a brand new set of PhitGrips to review. I spoke with her on August 11th, and received them within a week! I was super impressed with the fast shipping, and couldn't wait to try them out. Right away I tossed them in my purse so I wouldn't forget, and they didn't take up much space. I went shopping the very next day, and I have to say that I love them! 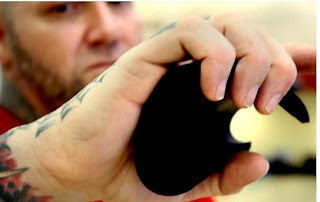 You may be asking, what in the world is a PhitGrip?! To be honest, I had never heard of PhitGrips until just a couple weeks ago. When I heard about them, I became very intrigued and couldn't wait to try them myself. 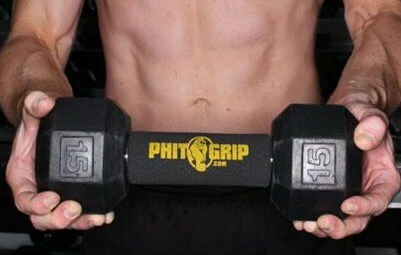 PhitGrips are portable soft rubber grips that were originally designed to fit over the bars of gym equipment to protect against germs. That's not their only use... PhitGrips are a great new product for Moms, offering protection against germs found on grocery cart handles! Did you know that grocery cart handles have more germs than public restrooms? Ewww! Yes... A study at The University of Arizona 2007 proved that a shopping cart is one of the germiest surfaces. PhitGrips are American made, and are made of liquefied rubber that has been injected with oxygen to make them light and cushioned. The ink that they print the logo on the PhitGrip contains an antimicrobial agent to help inhibit the growth and spread of bacteria. All you have to do is rub your hands together occasionally to spread the antimicrobial protection over your hands. Sounds awesome, eh? They are easy to slip on and off grocery cart handles, and no hassle at all to store them in your purse. When the logo wears off, it means it's time to purchase a new set. They only cost $9.99 and can be purchased through their website. "Win a set of PhitGrips from @kimmie_1980 http://tinyurl.com/2cxeery (09/12) #giveaway"
***Giveaway ends September 12@ 11:59 ET!!!! * This giveaway is available to US and Canadian readers. * There may be shipping charges or, in the case of Canadian addresses, international fees for certain products. I received a complimentary pair of PhitGrips to try in exchange for my honest opinion and a review of my experience. I did not receive any other compensation or incentive nor was I required to write a positive review. Individual results or experiences may vary.